Posted By:Unknown | At:10:43 AM Be the first to comment! CHICAGO— In the end, it was just Oprah. For the final episode of "The Oprah Winfrey Show" taped Tuesday, the talk show queen appeared alone on her Chicago stage, talking to viewers about what they've meant to her during the show's 25-year run. The finale will air on Wednesday. 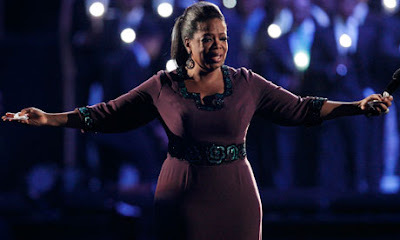 Fans leaving Tuesday's taping said Winfrey had tears in her eyes as the television icon said a final thank you. "She said, `This isn't goodbye. This is until we meet again," said Amy Korin, 32, of Chicago, who was in the audience. Winfrey then kissed and hugged her longtime partner, Stedman Graham, and made her way through the halls of Harpo Studios, saying goodbye to her staff, audience members said. She kept saying, "We did it! We did it!," Korin said, and giving employees high-fives. There was a single chair on the stage, but Winfrey stood most of the time, audience members said. "A lot of crying and hugs, crying and hugs," Korin said. Audience members described a simply produced series finale filled with a sense of gratitude. "It was just her the whole time, a recap of what she believed in, what we've given her as viewers and what she hopes she has given us," said Nancy Evankoe, 60, Hoffman Estates, who went to the taping with her daughter. Winfrey announced in November 2009 that she would end her popular talk show after 25 years. Tuesday's taping comes a week after Hollywood's A-list and 13,000 fans bid Winfrey farewell during a double-episode extravaganza at Chicago's United Center. The shows that aired Monday and Tuesday included Aretha Franklin, Tom Cruise, Stevie Wonder, Michael Jordan and Madonna, among other stars of television, music and movies. The bare-bones final taping had its share of celebrities in the audience including Tyler Perry, Maria Shriver, Suze Orman and Cicely Tyson, but none of them joined Winfrey on stage. There were 404 audience members, according to Harpo Productions. Hundreds of giddy fans struck by their luck at getting tickets for the final show had gathered outside Winfrey's television studio in Chicago Tuesday morning. Sarah Cranley, 32, of Chicago waited in line with her mother, who traveled in from Pittsburgh for the taping. Cranley said she felt very lucky to snag tickets to the last show and the prospect of seeing Winfrey live didn't yet feel real. "You think about how many billions of people around the world watch her and want to be here," Cranley said. "What are the odds?" Cranley's mother, Sally Mowrey, 59, said Winfrey was a constant in her life when her husband's job transfers had her family move 17 times. "That was something I could count one, watching Oprah," Mowrey said. "That was one thing that didn't change." Fans said they went through the normal ticketing process for the final taping by submitting their names online. Some said they wrote letters explaining why they were Winfrey fans. Winfrey's best friend Gayle King mixed with the waiting fans and interviewed several with a camera phone. For her, the show's end is bittersweet. "I have such mixed feelings about it," King told fans.